Fiber optic cables has become a standard component in most contemporary cable infrastructures. As used for optical fibers varies, fibre optic cable manufacturers have produced cables to meet specific needs, and it is likely that moe will be created as future applications emerge. Bear in mind that different cable arrangements are variations on theme. Different combinations of buffer types, strength members, and jackets can be used to create cables to meet the needs of a wide of industries and uses. The simplest types of cables are actually called cordage, and are used in connections to equipment and patch panels. They are typically made into patch cords or jumpers. The major difference between cordage and cables is that cordage only has one optical-fiber/buffer combination in a jacket, while cables may have multiple optical fibers inside a jacket or sheath. The two common types of cordage are simplex and duplex. Simplex cordage consist of a single optical fiber with a tight buffer, and aramid yarn strength member, and a jacket. Simplex cordage gets its name from the fact that, because it is a single fiber, which is typically used for one-way, or simplex, transmission, although bidirectional communications are possible using a simple fiber. Duplex cordage, also known as zipcord, is similar in appearance to household electrical cords. It is a convenient way to combine two simplex cords to achieve duplex, or two-way, transmissions without individual cords getting tangled or switched around accidentally. Distribution cables is need when it requires to run a large number of optical fibers through a building. Distribution cable consist of multiple tight-buffered fibers bundles in a jacket with a strength member. These cables may also feature a dielectric central member to increase tensile strength, resist bending, and prevent the cable from being kinked during installations. These cable are ideal for inter-building routing. Depending on the jacket type hey may be routed through plenum areas or riser shafts to telecommunications rooms, wiring closet, and workstations. The tight-buffered optical fibers are not meant to be handled much beyond the initial installation, since they do not include a strength member and jacket. Distribution cables may carry up to 144 individual tight-buffered optical fibers, many of which may not be used immediately but allow for future expansion. Armored fiber optic cable has two jackets. The inner jacket is surrounded by the armored and the outer jacket or sheath surrounds the armor. This cable can be used for indoor and outdoor applications. Armored cables are used for outdoor application is typically a loose tube construction designed for direct burial applications. The armor is typically a corrugated steel tape surrounded by an outer polyethylene jacket. This combination of outer jacket and armor protects the optical fibers from gnawing animals and the damage that can occur during direct burial installations. Armored cables used for indoor applications may feature tight-buffered or loose-buffered optical fibers, strength members, and an inner jacket. The inner jacket is typically surrounded by a spirally wrapped interlocking metal tape armor. This type of armor is rugged and provides crush resistance. These cable are used in heavy traffic areas and installations that require extra protections, including protection from rodents. 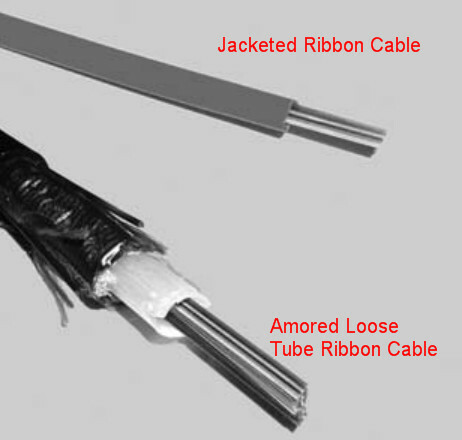 As it name indicate that fiber optic ribbon cable contains fiber ribbons, which are actually coated optical fibers placed side by side, encapsulated in Mylar tape, similar to a miniature version of wire ribbons used in computer wiring. A single ribbon may contain 4, 8, 12 optical fibers. Ribbon cable can be stacked up to 22 high. Because the ribbon contains only coated optical fibers, this type of cable takes up much less space than individually buffered optical fibers. As a result, ribbon cables are denser than any other cable design. They are ideal for applications where limited space is available, such as in an existing conduit that has very little room left for an additional cable. Besides, ribbon cables come in two basic arrangements wich is loose tube ribbon cable and jacket ribbon cable. In the loose tube ribbon cable, fiber ribbons are stacked on top of one another inside a loose-buffered tube. This type of arrangement can hold several hundred fibers in close quarters. The buffer, strength members, and cable jacket carry any stain while the fiber ribbons move freely inside the buffer tuber. The jacket ribbon cable looks like a regular tight-buffered cable, but it is elongated to contain a fiber ribbon. This type of cable typically features a small amount of strength member and a ripcord to tear through the jacket. Ribbon fiber provides definite size and weight savings, it does require special equipment and training to take advantage of those benefits. Connectors, strippers, cleavers, and fusion splicers must all be tailored to the ribbon fiber. For these reasons, ribbon fiber may not be the best solution in all situations. 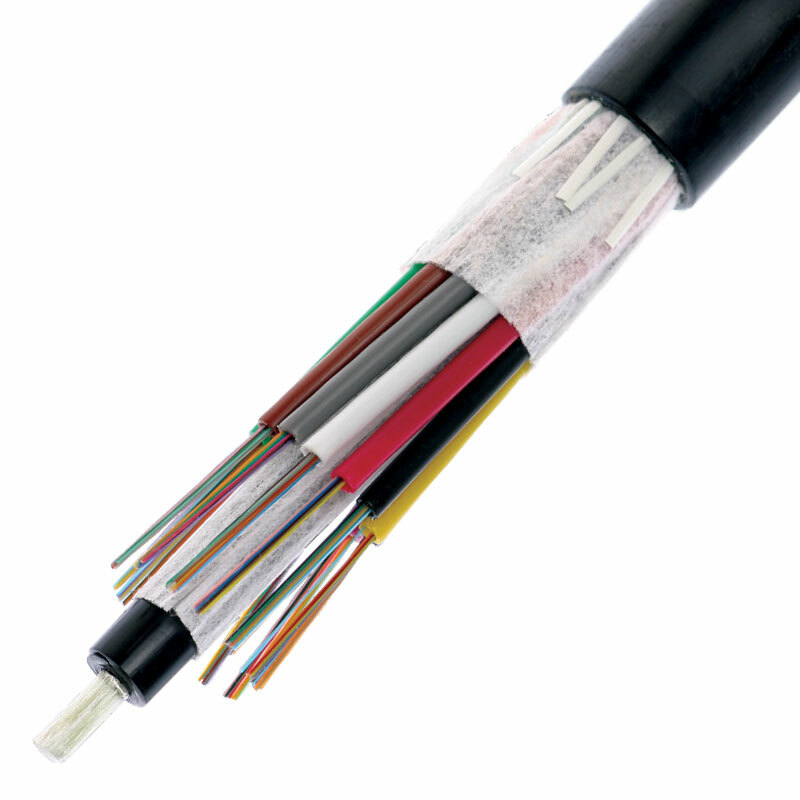 Expect the above cables, there are also other fiber optic cable types like Submarine cable for carrying optical fiber underwater; Aerospace cable designed to be installed in aircraft and spacecraft; Aerial cable (figure 8 cable) for aerial installations; Hybrid cable combined multimode and single-mode optical fibers in on cable as well as the composite cable that designed to carry both optical fiber and current-carrying electrical conductors in the same run. You hear about fiber optic cables whenever people talk about telephone system, cable TV system or the Internet. They are also used in medical imaging and mechanical engineering inspection nowadays. How much do you know the basic information of cables? For example, what a 9/125/250µm cable mean. In this article, we will show you some cable basics. The size of the optical fiber is commonly referred to by the outer diameter of its core, cladding and coating. Example: 50/125/250µm indicates a fiber with a core of 50 microns, cladding of 125 microns, and a coating of 250 microns. The coating is always removed when joining or connecting fibers. A micron (µm) is equal to one-millionth of a meter. 25 microns are equal to 0.0025 cm. (A sheet of paper is approximately 25 microns thick). Cables can be identified by the type of paths that the light rays, or modes, travel within the fiber core. Also according used in different environments, there are outdoor cable, waterproof cables, lszh cable, submarine optical cable, etc. These cables are small in size, and used for short, dry conduit runs, riser and plenum applications. The fibers are double buffered and can be directly terminated, but because their fibers are not individually reinforced, these cables need to be broken out with a “breakout box” or terminated inside a patch panel or junction box. They are suitable for conduit runs, riser and plenum applications. Because each fiber is individually reinforced, this design allows for quick termination to connectors and does not require patch panels or boxes. 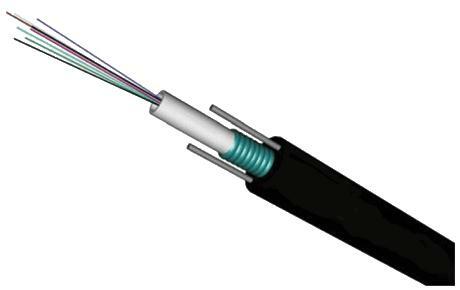 Breakout cable can be more economical where fiber count isn’t too large and distances too long, because is requires so much less labor to terminate. These cables are composed of several fibers together inside a small plastic tube, which are in turn wound around a central strength member and jacketed, providing a small, high fiber count cable. This type of cable is ideal for outside temperatures and high moisture conditions(waterproof cables also do good jod in moisture conditions), as it made with the loose tubes filled with gel or water absorbent powder to prevent harm to the fibers from water. It can be used in conduits, strung overhead or buried directly into the ground. This cable offers the highest packing density, since all the fibers are laid out in rows, typically of 12 fibers, and laid on top of each other. This way 144 fibers only has a cross section of about 1/4 inch or 6mm! Some cable designs use a “slotted core” with up to 6 of these 144 fiber ribbon assemblies for 864 fibers in one cable! Since it’s outside plant cable, it’s gel-filled for water blocking. Indoor/Outdoor cables combine the flame resistance and safety features of an indoor riser or plenum cable with the durability that is critical for OSP use. 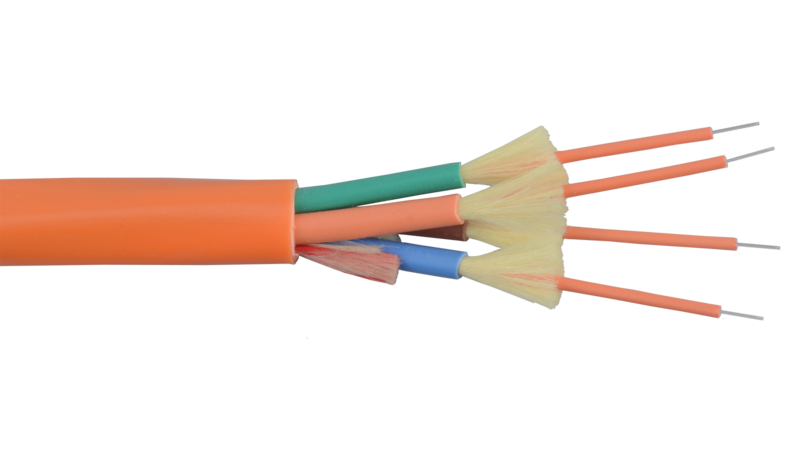 The result is a unique, dual-purpose cable that can save time and money by allowing OSP applications to flow seamlessly indoors, using a single cable and no splices. Aerial cables are for outside installation on poles. They can be lashed to a messenger or another cable (common in CATV) or have metal or aramid strength members to make them self supporting. 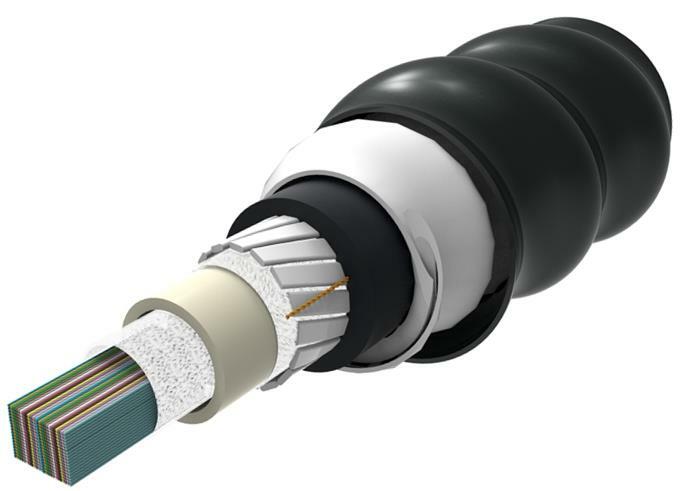 These cables combine specialty optical fiber with cabling construction that make installation or deployment easier and/or protect the fibers for long-term use in harsh environments. Even more types of cables are available and also many brands cables from different manufacturers are available. Corning is one of the outstanding fiber optic cable manufacturers, who invented the first commercially viable low-loss optical fiber in 1970. Today Corning remains the global market leader in the industry, the corning fiber optic cable is recognized for their excellence and innovation.